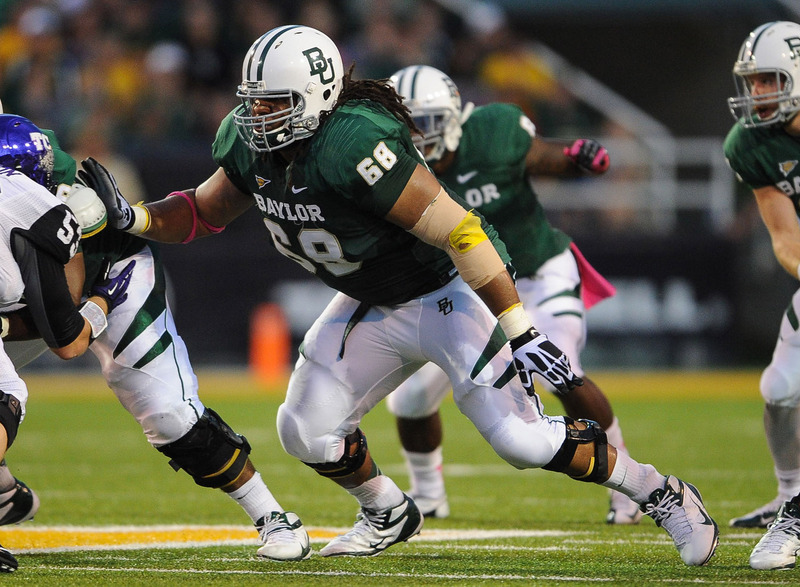 Cyril Richardson was a 2nd team All-American and 1st team All-Big 12 selection in 2012. He has 29 starts at both left tackle and left guard. Big 12 coaches voted him as the best offensive lineman in the conference last season. Richardson is a powerful, physical player that can be dominant at times. He has a good combination of strength and athleticism. For a 6’5” 335 pound player, he has light feet and does a good job pulling and trapping. He has a good understanding of blocking angles and has a firm base in pass protection. Richardson could possibly play right tackle at the next level, but would likely be a better fit as a guard. I believe he could be a dominant guard in the NFL. David Yankey was a 2nd team All-American and 1st team All-PAC 12 as a left tackle in 2012. He has started at both guard and left tackle, but he will be moving back inside for his senior season. Yankey has started 27 games going into this season and only gave up one sack as a left tackle. The Cardinal offense is known for pounding opponents and Yankey is a big part of the success of the running game. He plays with good pad level and has the ability to drive opponents off the ball. Yankey is a nasty run blocker with a mean streak. He does a good job pulling and getting into space. The tricky thing will be predicting where Yankey will play in the NFL. I don’t believe he has the flexibility to play at offensive tackle, but he could be a very successful guard at the next level. Gabe Jackson has been a starter since his freshman season for the Bulldogs with 39 starts prior to this season. He was selected to the SEC All-Freshman team in 2010 and has been a 2nd team All-SEC selection the last two seasons. Jackson is the anchor of an offensive line which rushed for more than 150 yards in half of their games in 2012. He has good size at 6’4” and 335 pounds, but he also has the lower body explosion to vertical jump 31 inches. Jackson is a mauler in the run game and he excels at cut blocking defenders. Xavier Su’a-Filo has started at both left tackle and left guard for the Bruins. He started all 13 games at left tackle in 2009 as a true freshman. He then went on a two year Mormon mission, returning to play in 2012 and starting at left guard, earning 3rd team All-American and 1st team All-PAC 12 honors. Su’a-Filo is quick off the ball and is a good drive blocker. In pass protection he shows good balance and lateral movement. He has good strength and does a good job against the bull rush. Su’a-Filo also has the feet to pull and lead the sweep to the outside. Anthony Steen was the “other guard” at Alabama last year as Chance Warmack got all the publicity. An ESPN article in April described him as the Ringo Starr of the Alabama offensive line. With an offensive line that had three NFL draftees, Steen was the guy that quietly went about his work. Most people don’t notice offensive linemen unless they are called for a penalty or give up a sack. That’s probably why not a lot of people have heard of Steen. He started 14 games last year with zero penalties and zero sacks given up. He is beginning his third year as the starting right guard. Steen has a good combination of quickness, power and competitiveness. I believe this year is Steen’s year to shine and improve his draft position. This entry was posted on August 21, 2013 by draftmaniacs in Top 5 at each position and tagged 2014 NFL draft, Alabama football, Anthony Steen, Baylor football, Cyril Richardson, David Yankey, Gabe Jackson, Mississippi State football, NFL Draft, Stanford football, UCLA football, Xavier Su'a-Filo.